Toxoplasma gondii is a single celled organism that is known for being the cause of toxoplasmosis, a common food born illness. 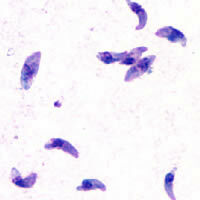 T. gondii is a unicellular, parasitic protist, classified as an apicomplexan within the group alveolate. Apicomplexans are exclusively parasitic organisms and derive their name from their apical complex. T. gondii is a close relative of plasmodium, the parasite that causes malaria. Like plasmodium they share structural characteristics, most importantly specialized organelles in the apical end. Unlike plasmodium however, T. gondii is able to survive outside the liver cells and red blood cell. In fact, T. gondii is able to inhabit any cell in the body. One study found that nearly one quarter of adults and adolescents in the United States have been infected with T. gondii. And while many of those infected with T. gondii do not display symptoms, individuals with compromised immune systems such as those infected with the AIDS virus have an increased risk of death due to Toxoplasomosis. When a person becomes infected with T. gondii they may experience mild with flu-like symptoms that last for several weeks and then go away, such as tender lymph nodes, and muscle aches. A healthy individual however, may not have symptoms because their immune system can keep the parasite from causing illness. According to Carl Zimmer one third of all people living on this world are infected with T. gondii even though few are aware about it. People with compromised immune systems, such as individuals with HIV have a much higher risk for developing severe signs of toxoplasmosis, and may experience severe symptoms such as fever, confusion, headache, seizures, nausea, and poor coordination. 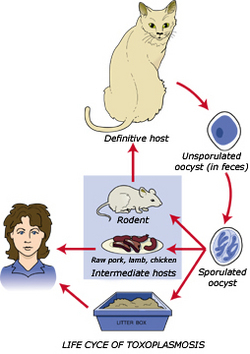 Toxoplasmosis is generally not passed from person-to-person, but can be passed from mother to child during pregnancy. Infection of the fetus can lead to miscarriage, a stillborn child, or a child born with abnormal enlargement or smallness of the head. Infants infected before birth often show no symptoms at birth but develop them later in life with potential vision loss, mental disability, and seizures. 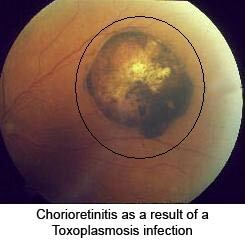 Another common manifestation of toxoplasmosis is retinochoroiditis, or eye disease. These eye infections can lead to acute inflammatory lesions of the retina. Associated symptoms are eye pain, sensitivity to light or photophobia, tearing of the eyes, and blurred vision. Eventual blindness will result if the central structures of the retina are infected by the parasite. Most healthy people are able to recover from the various flu-like symptoms of toxoplasmosis without treatment. The parasite however, may remain within the host cells in a less active phase. If a person were to become sick they can be treated with drugs such as pyrimethamine or sulfadiazine, and folinic acid. Additionally, ocular lesions caused by toxoplasmosis can be treated by various means. Treatment of patients with compromised immune systems is more complicated for they may need long-term treatment as long as they are immunosuppressed. Much of the research being done T. gondii looks at the connection between toxoplasmosis and HIV. This sort of research is important because nearly 60% of deaths in patients with AIDS are a direct result of infection other than HIV, one of which is toxoplasmosis. A case study was done by Sharenda Williams and Elizabeth Burton on toxoplasmosis in a patient with undiagnosed AIDS. The case involved a 44-year-old Hispanic man who presented with fever, chills, cough, weight loss, abdominal pain, nausea and vomiting, diarrhea, headache, eye pain, and fatigue. The patient underwent an extensive infectious workup, including tests for various organisms other than T. gondii. Although treated with antibiotics including levofloxacin, metronidazole, doxycycline, and caspofungin for presumed sepsis the patients symptoms persisted and he died after 4 days in the hospital. An autopsy revealed Toxoplasma gondii cysts (bradyzoites) and free tachyzoites (trophozoites) in the heart, lungs, brain, adrenal glands, appendix, stomach, pancreas, bladder, right testis, spleen, gallbladder, lymph nodes, muscle, and bone marrow upon microscopic analysis. In this case the presence of T. gondii was only determined post-mortem. A new method of detection and diagnosis of toxoplasmosis in patients with AIDS is being researched by Yenisey Alfonso et al. Their paper discusses the molecular diagnosis of Toxoplasma gondii infection in cerebrospinal fluid from AIDS patients. The aim of this study was to evaluate a rapid PCR method using the B1 gene to detect T. gondii in CSF samples from patients with suspected Toxoplasmic encephalitis. TE is one of the most common infections in immunocompromised patients, and is the main cause of cerebral lesions in HIV patients. The detection of Toxoplasma gondii by PCR may facilitate the diagnosis of TE in patients with AIDS. In this study diagnosis is accomplished by direct identification of the parasite DNA in tissue samples. The results of this study showed that using the B1 gene and B22/B23 set of primers in PCRs is a rapid and reliable method for determining the present of Toxoplasma gondii in an individual. Additionally this procedure can be used to differentiate between toxoplasmosis and other central nervous system (CNS) diseases. A large-scale survey on the prevalence of Toxoplasma gondii across the United States which also contains analyses of correlation with a number of other variables. For example, the correlation was found to be notable for diet and environment, weaker for cat ownership. This page was last modified 21:02, 30 October 2013.